Today we gather to celebrate the life and spirit of Sister Irene Murphy. We rejoice and thank God for her fidelity to her vocation, her love for the congregation, and her dedication to serving God and others. 98 years ago Irene was born on January 17th in Lowell, MA. She was one of the 7 children of William and Mary Murphy. At the age of 20, she entered the Grey Nuns of the Sacred Heart, following in the footsteps of her two older sisters, Sister Estelle Marie and Sister Mary Alice. Irene spent 51 of her 78 years as a Grey Nun as a teacher. She influenced thousands of children in Jackson Heights, Corona, Depew, Buffalo, and Ogdensburg, New York as well as, Atlanta, GA., Lowell, MA. and Melrose Park, PA. 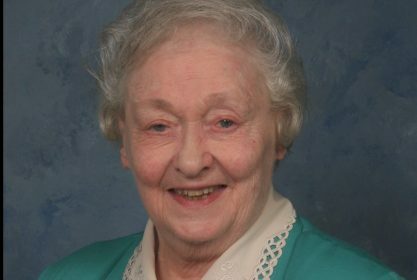 Upon hearing of her death, several of her former students contacted the congregation and shared positive comments of their relationship with Irene. On a personal level, my friendship with Irene spans 66 years. I met her when I was 12 years old and in the 8th grade at Immaculate Conception School in Lowell, Massachusetts. I needed no introduction to Sr. Mary Regis as her older sister, Marie, and my mother were best friends. If you were ever missioned in Lowell you’ll recall that before school each morning students would line up at the fence at the back door of the convent. As a sister would come out the door a student would run to greet her and carry her school bag. I was there each morning to carry Sister Mary Regis’ school bag to the classroom and help her prepare papers for her 1st graders. After I graduated from 8th grade, Irene kept contact with me throughout my high school years. When I decided to enter the Grey Nuns of the Sacred Heart, Irene assisted me with all the preparations. Throughout my own religious life, Irene has always supported me and inspired me. She had that same positive impact on so many of her students. Sister Irene had many gifts and talents. If I had to select one word to describe her it would be faithful. She was faithful to God. Throughout her life, her main priority was to devote time and energy to developing her relationship with God through prayer, meditation and contemplation. She had devotion to the Sacred Heart and relied on the Blessed Mother to strengthen and sustain her. In her bedroom, on the table beside her bed was her rosary, a statue of Our Lady of Fatima and her Vade Mecum, a book of prayers and traditions of the Grey Nuns of the Sacred Heart. Sister Irene was faithful to her family and friends. She loved visits and phone calls. Irene was interested in people. She listened to their stories, offered advice and assured them of her prayers. Sister Irene was a faithful friend. Sister Irene was faithful to her ministries. She devoted most of her life to teaching. Roberta Purser Brietbeil, Sister Kay Purser’s sister, visited her with Kay. Roberta asked Irene what was the largest class she taught. The answer was 72 children. Imagine how dedicated and faithful you would have to be to teach 72 first graders how to read! Irene taught both Kay and Roberta in first grade at Christ the King School in Atlanta. The Scripture readings chosen by Sister Irene for this liturgy give us insight into spiritual themes that were important to her. In Romans 8, St. Paul reminds us that God’s love is always present to us. Nothing can separate us from that love, absolutely nothing. Our hope strengthens and sustains us. If we reflect on Irene’s life, we can see the threads of hope throughout her 98 years. In times of joy and sorrow, she remained steadfast and faithful to God’s will. The beatitudes are promises of happiness made by Jesus to those who faithfully accept His teachings and follow His example. The word beatitude literally means bliss. Irene was a faithful follower of Jesus. Imagine Irene’s bliss as she was welcomed into the kingdom of heaven. All of us can rejoice and be glad, for our dear Sister Irene has faithfully fulfilled the challenges of her long life and is now at home with God. Sister Irene Murphy, GNSH (formerly Sister Mary Regis), 98, died July 31, 2018 in the 78th year of her religious life. Irene Catherine Murphy was born in Lowell, MA on January 17,1920 the daughter of the late William J. and Mary E. (O’Loughlin) Murphy. She was one of seven children– six girls and one boy. She received her BS in Education (1949) from D’Youville College, Buffalo, NY. Irene Catherine Murphy followed two of her five sisters into religious life, entering the Grey Nuns of the Sacred Heart on September 15, 1940. This lifelong educator spent the last 15 of her 51 years of teaching at Our Lady of Fatima, Jackson Heights, NY (1978-93). She also taught at Blessed Sacrament (1943-45) and St. Leo’s (1959-63), Corona, NY. Students at Immaculate Conception (1952-55, 57-59, 63-65), Lowell, MA; Christ the King (1945-52) and St. Jude the Apostle (1968-69), Atlanta, GA; Holy Angels, Buffalo (1955-57,1966-67), St. James, Depew (1965-66) and Bishop Conroy, Ogdensburg (1967-68) NY were the beneficiaries of her teaching skills over the years of her ministry. She also taught at Melrose Academy (1940-41, 1969-78) Philadelphia, PA. Upon retiring to the Motherhouse in 1994, Sister Irene immediately began to volunteer her services in various ways within the Congregation, continuing until her health declined. She moved to the Redeemer Sisters Magnificat Center in July 2016, along with other Grey Nuns of the Sacred Heart. In addition to her religious congregation, Sister Irene is survived by several nieces and nephews. She is predeceased by her parents and siblings Marie, Joseph, Rita Gurry, Sister Estelle Marie, GNSH, Sister Mary Alice, GNSH and Helene Wheeler. A Mass of Christian Burial will be offered on Saturday, August 4, 2018 at 10:30 a.m. in the Redeemer Sisters’ Chapel, 521 Moredon Road, Huntingdon Valley, PA, 19006, preceded by a viewing and words of remembrance. Interment in Resurrection Cemetery. In lieu of flowers, memorial donations in thanksgiving for Sister Irene’s life of service may be made online to the Grey Nuns of the Sacred Heart, or by mail at the following address:14500 Bustleton Avenue, Philadelphia, PA 19116-1188. Sister Irene Murphy as Sister Mary Regis was also my 1st grade teacher at Christ the King in the 40’s and I still remember her warmth and kindness. I asked her recently what was the largest class she ever taught. She said 72 pupils! May she rest in peace. Sister Irene was able to see the genuineness of her students. She foretold I would be a teacher when I grew up. That was in fourth grade and unbeknownst to me she was right! She was a true blessing in my life one of the few sparkly people I had encountered growing up. She knew her stuff and made sure her students kept the straight and narrow. “Shape up or ship out!” I don’t think the latter was ever really an option though. She was an example of a true follower of Christ. God Bless her and her beloved. Sister Mary Regis was a wonderful teacher to have in first grade. I felt scared and she made me feel completely at ease. It was a good first year at Christ the King School in Atlanta in 1946-47, because Sister Mary Regis was so kind and generous to all of us. I don’t think she taught me, but she taught my brother John and sister Kathryn. I remember her with warmth, as I remember all the Grey Nuns who taught me at Christ the King. May she rest in peace. I didn’t know her but I knew her sister, Sister Mary Alice who taught at St. Leo when I was there as a child. Sister Mary Regis was my 1st grade teacher at Christ the King School in Atlanta, Ga. I broke my leg that year and Sister was always so kind to me.